San Sebastian is in the Basque Country in Spain. It's popular with tourists in part because it has one of the best in-city beaches in Europe. You can hit the waves or soak up the sun right near many interesting historic buildings and churches. This is a popular destination for surfers who head to La Zurriola on the eastern side of the Old Town. La Concha is the other main beach in the area. It's on the western side of the Old Town and is larger but lacks the waves that you'll find at La Zurriola. Accommodation prices in San Sebastian can be a little more expensive than elsewhere in Spain. There are a handful of great hostels around the city. Some are located in or near the Old Town, and make a nice central location if you want to explore both the city and the beaches. 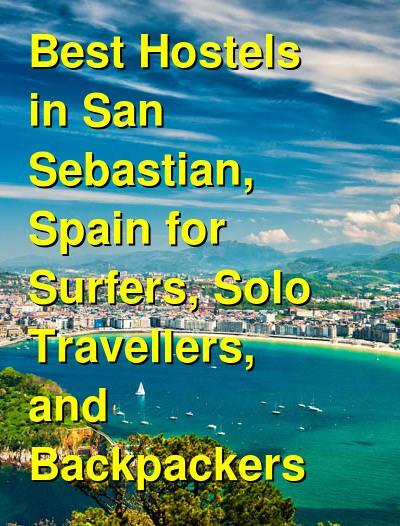 How much do hostels in San Sebastian cost? A good hostel for surfers, small groups, and solo travellers. Surfing Etxea is located in La Zurriola Beach in the city of San Sebastian, Spain. It's just a short walk from the beach and is in the old part of the city. This hostel is the perfect place to stay if you like to surf or want to learn how. Surfboards are available for rent and there are classes for both surfing and standup paddle boarding. The hostel also offers all of the standard amenities including free wi-fi throughout, bicycle rentals, and a safe and secure environment. There's also a nice terrace where many guests enjoy relaxing outside and enjoying the weather. The hostel has six and nine bed dorm rooms available. The rooms and bathrooms are all kept very clean. It's a fun place to meet other travelers but it's also a quiet place to get a good night's sleep. You have to leave the hostel to drink alcohol, so many guests head out on the town in the evening and come back to sleep. The staff here are very relaxed and respectful of guests. They can help you with any questions that you might have and they work hard to make sure everyone has a good time. A Room in the City is a popular hostel in the city center of San Sebastian. It's a relaxing and fun place to stay where it's easy to meet other travellers. It's also conveniently located whether you want to explore the city or head to the beach. It's about a three minute walk to La Conca Beach and is also just a short walk from La Zurriola Surf Beach. It's a pleasant ten minute walk along the seaside to the Old Town. In the Old Town you'll find the area's best nightlife, restaurants, and cafes. There is also plenty of shopping and quaint neighborhoods to explore in the area. This hostel has a range of room types available for guests. There are both twin and three bed private rooms available. Twin rooms have bunk beds and dorms sleep four, six, eight, or twelve people. The rooms are large with a lot of natural light and the beds are comfortable. There are also several great common areas including a living room and dining room. There are books that you can borrow and a public computer that you can use. There is also a microwave, toaster, refrigerator, and various dishes which guests can use. A good hostel for couples and small groups. Adore Plaza is another popular place to stay in San Sebastian. It's centrally located in the heart of the Old Town and is walking distance to many of the area's top attractions. It's near many different beaches, parks, and museums. This is a social hostel and it's surrounded by the area's best nightlife. You can be assured that there will be other guests headed out on the town. Nearby you'll find many different bars, pubs, restaurants, cinemas, and clubs. Adore Plaza is near the Constitution Square, which is a charming area with a lot of character. The buildings nearby are quite charming and there is a lot to do in the area. This hostel has twin, double, and four bed private rooms available. Guests can choose between rooms with private bathrooms or shared bathrooms, depending on your budget and travel preference. The staff will help you with any questions you might have and they can offer any number for recommendations from the area's best restaurants and bars to the closest and nicest beaches.